A Notary Public may create, sign and authenticate a wide range of documentation. When you require legal services of a non-contentious nature -- i.e. where the parties are agreeing to the contents of the agreement -- you can use the services of Notary Public, the same way you would seek the services of a lawyer/solicitor. BC Notaries are unique in North America, providing non-contentious legal services to the general public. Each and every day most Notaries explain what they do. It’s an old profession. Notaries Public (the correct plural of Notary Public) were the principal agents, scriveners, and scribes for commercial and judicial law. The tradition of trust goes back over 2,000 years. Notaries laid down the Codex Hammurabi, the oldest evidence of documented law. Notaries were also employed by the Catholic Church to be the guiding light of civilization through the Dark Ages. Throughout centuries of upheaval, the Notary’s reputation for trustworthiness ensured that documents remained reliable. Notaries in British Columbia are legal professionals providing an alternative to lawyers, practicing within clearly delineated areas of law. BC Notaries are governed by the Notaries Act and by the Society of Notaries Public of British Columbia. Members of the Society have an obligation (upheld by the courts) to provide services that are at least equal in quality to those provided by lawyers. As with lawyers, the professional work of a Notary is covered by an insurance plan that protects the public. The position of Notary Public as a member of one of the branches of the legal profession is sanctioned and safeguarded by law. The B.C. Notaries Act sets out the services a Notary Public can provide. Training for a B.C. Notary Public career requires a bachelor degree and a Master of Arts in Applied Legal Studies (offered only at Simon Fraser University). The candidate writes a set of comprehensive statutory examinations. Notaries Public are commissioned for life by the B.C. Supreme Court. The professional work of a Notary is covered by a comprehensive insurance plan which protects the notary clients. Modern day Notaries do not get involved in litigation or argue cases before a judge. Their activities are restricted to non-contentious matters – those where the parties involved are in agreement. A Notary’s strength is in preparing accurate, reliable legal documents in order to assist the general public in BC. Before candidates can begin training for a career as a Notary Public, they must submit to a scrupulous review of their personal, financial, educational and business background. This screening reviews their character, reputation and integrity. 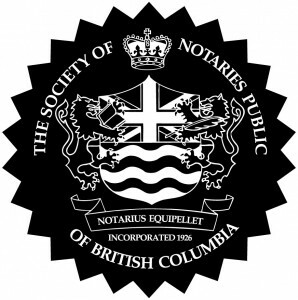 As of April 2014 there are 23 Notaries Public practicing in and around Greater Victoria, with offices in Victoria, Saanichton, Oak Bay, Brentwood Bay, Sidney and Sooke. Demographically, the average age of a B.C. Notary is 43. About 55 percent of BC Notaries are women. Many ethnic backgrounds and languages are reflected in the profession.